A year and a half ago in this column I criticised the pervasiveness of television betting adverts during live sporting events, especially football matches. What most annoyed me was the way these ads attempt to cajole prospective punters who are, mainly, young men (as a Times columnist put it: “Women are too smart for this game”) into thinking that having a flutter on the result of a match, the goal scorers or things like the number of bookings or corners, is somehow cool or macho. I referred at the time to a study that found that a quarter of men between the ages of 18 and 24 had gambling problems of varying degrees of severity. Happily, the penny has dropped. Last month the UK Industry Group for Responsible Gambling (IGRG) announced a “whistle to whistle” ban on all TV betting commercials during pre-watershed (9pm) live sport, starting five minutes before the event begins and ending five minutes after it finishes. As the IGRG’s press release states, this will “effectively stop betting adverts from being shown in commercial breaks during televised live sport”. It’s expected that the measure will be introduced next summer, before the start of the 2019/2020 football season. The ban is voluntary, but it’s in response to growing pressure from MPs on the government and betting companies to do more to tackle problem gambling. The Labour Party’s deputy leader, Tom Watson, said that: “With over 430,000 problem gamblers in the country, many of them children, the number of adverts during live sports had clearly reached crisis levels”. He sees the decision as recognition that the “proliferation of gambling adverts has got completely out of hand” and says the next step should be to curb the number of gambling advertisements online. According to the UK Gambling Commission one in ten children follow social media accounts run by betting companies, illustrating the extent of the problem. The industry may also wish to consider whether, in the light of the forthcoming TV ban, it’s acceptable for football clubs to continue to endorse betting companies on their match-day shirts and for gambling adverts to still be shown on stadium publicity hoardings. As a committed Manchester United fan, this season is proving to be a disappointing one for me. Maybe under a new manager our fortunes will improve. 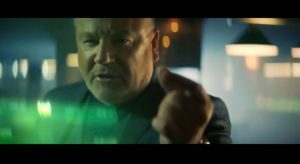 But even if they don’t, watching televised matches should be a more pleasurable experience come August, without the likes of actor Ray Winstone haranguing me to place an “in play” bet on whether a particular player will be sent off or how many throw-ins there’ll be. We’d discussed it at home some time before the announcement was made – all hell’s going to break loose this Christmas when angry motorists, their cars chock-full of presents, find they can’t park anywhere thanks to the residential parking scheme. They’re going to have to call an amnesty, I predicted. Sure enough, up popped the minister for Planning on our TV screens to tell us that all residential and district parking zones were being temporarily suspended over the festive season. Until today in fact: be careful where you park tomorrow. This, the minister told us, would allow everyone to celebrate with family and friends without having to be concerned about parking. So why not relieve us of those concerns all year round? After all, to paraphrase the UK Dogs Trust’s famous slogan, Family and Friends are for Life, not just for Christmas.